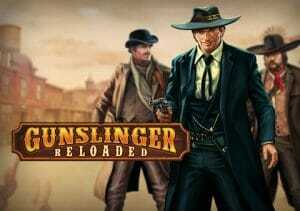 Go on a Wild West shoot out in Gunslinger: Reloaded. Created by Play ’N Go, it’s a 5 reel, 25 payline video slot that comes with a free spins round where all payouts are doubled, a bounty hunter bonus where you could win 960 times your bet as well as a progressive jackpot prize. Play on all devices from between 25p and £100 per spin. Gunslinger: Reloaded looks excellent – the setting is a classic old west town. On the reels you’ll see lower value poker cards and chips as well as a sheriff’s badge and a locket featuring the bounty hunter’s sweetheart. The pouch of gold is the top of the standard symbols, paying 40 times your bet if you land 5 in combination. More lucrative still is the bounty hunter wild. This replaces all other symbols bar the scatters. Land 5 wilds in a row and a massive 400 times bet payout follows. The horse scatter awards some none too shabby prizes too. Land 2, 3, 4 or 5 of these anywhere on the reels on the same spin and you’ll receive 2, 3, 15 or 150 times your bet. Play ’N Go has packed in a decent variety of extras into Gunslinger: Reloaded. Bottle Spins Free Spin feature – this round is triggered by landing the bottle scatter on the middle 3 reels on the same spin. Take aim and shoot 1 of the bottles which reveal the number of free spins awarded. This can be between 10 and 25 free spins. All payouts during the free spins are doubled. Unlimited retriggers are possible here too. Bounty Hunt feature – land the wanted poster on reels 1, 2 and 3 to trigger this round. You’ll then go toe to toe with one of bandits – Jessie Picket, Butch Curry or Wild Bill. Multiplier awards are on offer depending on how the contest goes. If you catch Wild Bill, you could end up with a payout of 240 times your bet. Apply the 4x multiplier and 960 times your total bet could be heading your way! Shoot the Cards feature – collect winning combinations of the playing card symbols. There you’ll have a shot at landing a progressive prize if you get sheriff stars on all the poker cards. Gunslinger: Reloaded is an impressive looking game. There’s a decent amount of action on offer from the features too. Variance wise it’s in the middle with maximum wins of 5,000 times your bet on each free spin with the 2x multiplier. You don’t often see a western on cinema screens these days. The genre remains a popular one with video slots players though and Gunslinger: Reloaded is a pretty good example of why. It might not be volatile enough for some tastes but the good looks and range of extras make it worth taking aim here. If you like the Wild West theme, NetEnt’s Dead or Alive cannot be beaten.